And he's done! 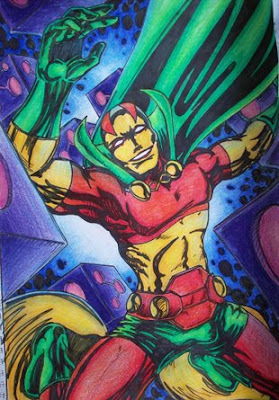 Mr Miracle is the latest character to become trapped for all time within the pages of my sketchbook. A choice from out of left-field - I've grown to like the character, even more than I did when I first put pen to paper. (To see the B&W version or for more on the character see previous posts). As DC's 'Super Escape Artist' he had to be escaping from something - flying round on those crazy yellow discs - and smiling as he does it. If this guy can escape from any trap, he may have a moment or two of fear, otherwise he'd be riding the adrenaline all the way to freedom. Here with an ominous energy portal in the background and some even more ominous 'Jack Kirby patterned' cubes, thats exactly what he's doing. Cool colours are kept in the background - getting bolder and warmer as we get closer to the foreground, while the arm foreshortening and the dots of energy behind him are all again direct tributes to his creator Jack Kirby. Now the truly inescapable question is: Who is next in the Sketchbook Challenge?